Trigger warning: a pup was harmed in this story. If you can’t stand the thought of a dog in pain, skip to the end of this story to see a thriving pooch. 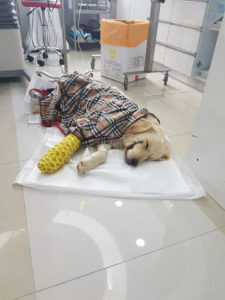 A Golden Retriever overcame the odds after sick pranksters sliced the puppy’s mouth to look like The Joker from the film Batman: The Dark Knight. The six-month-old dog, named Bobby, was left in dire straits. Rescuers in South Korea found the dog with her mouth tied with rope and wounds on her legs. Bobby was quickly transported to a veterinarian for immediate emergency care. The images are almost too painful to consider. Bobby suffered severe torture. She was so badly beaten that she could not eat or drink. Bobby was left for dead in a wasteland in the capital city, Seoul. Her condition was bad enough that she likely would not have survived had she not been found and received immediate treatment. The cruel thugs sliced the puppy’s mouth back on both sides to look like the Batman villain, The Joker. Her right foot was broken, and Bobby’s nails were smashed in. The young pup struggled to walk. Many burns and infected wounds were found on her legs and paws. “The wound on her mouth was likely caused by a knife but it could also have been a flame thrower. We don’t know why they would do that,” a spokesperson from Bobby’s care team said. Plainly, her condition was extremely precarious. Thankfully, the good samaritans that found Bobby immediately took her to care. 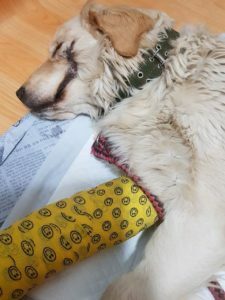 When Bobby reached the medical providers, she immediately underwent an operation and laser surgery to mitigate her numerous injuries. The doctors placed a cast on Bobby’s right leg to help heal the broken bone. Despite the sickening treatment that she faced, Bobby showed a dog’s immense resiliency. After her surgery she was found hobbling around the veterinary clinic, tail wagging for her caretakers. The torture did not cripple her spirit. Bobby’s loving personality was not broken. A South Korean animal welfare group named We Love Dogs raised the money needed to pay for Bobby’s care. We Love Dogs will provide for Bobby as she continues to mend from the results of her awful ordeal. “We were eager to treat Bobby. There were many traces of abuse all over her body,” a We Love Dogs spokesperson said. Although Bobby survived her harrowing ordeal and surgeries, there is still a long way to go. “Even though she was strong enough to heal from the many injuries and illness, she will need a lot of support to be strong again,” the same spokesperson commented. Unfortunately, the authorities do not know who harmed Bobby. Bobby overcame unthinkable cruelty. She battled for her life and won. But the fight is not over for this strong and sweet-natured dog. She continues to mend from what she endured.